Trenton L. Whitehouse jigged his way to victory during the Toyota Tundra Bassmaster Weekend Series, operated by American Bass Anglers, Oklahoma Division 14 tournament, held April 20, 2013, on Grand Lake o’ the Cherokees. Running out of Martin’s Landing on Monkey Island to fish the 46,500-acre lake, the 47-year-old angler from Bristow caught five bass weighing 22.13 pounds for a 4.43-pound average. For the Boater Division victory, Whitehouse took home a check for a guaranteed $5,000 since the tournament drew more than 100 boats. “I looked for big female pre-spawning bass feeding upon crawdads,” Whitehouse explained. “I flipped a 1/2-ounce jig around 45-degree rocky banks in eight to 10 feet of water down the lake. I put a Berkley Chigger Craw in green pumpkin on the back of it. I flipped it up into about five feet of water and worked the bait out to about 12 feet, hopping it along the bottom. I used 15-pound Seaguar line, which made a difference because the fish were biting so subtly. I caught 20 fish in all and culled twice.”In second for the 131 boaters, Lloyd Davenport, 61, of Stillwater found a five-bass tournament limit weighing 20.88 pounds. He anchored his bag with a 5.40-pounder to pocket $2,179. “I’ve been fishing this lake for 35 years,” Davenport said. “The water came up about four feet and the fish moved out a little farther. I was catching my fish in eight to 12 feet of water. I was using a Gene Larew Biffle Bug in a leech color on Seaguar fluorocarbon. The Seaguar line made a big difference in feeling the bites. I caught nine keepers.”Paul A. Thompson, 56, of Stillwater landed five keepers going 19.64 pounds with a 4.40-pound kicker. He went home with a check worth $1,453 in his pocket. 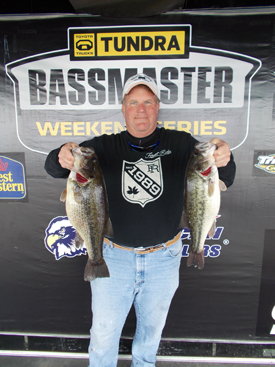 Robert Capps of Muskogee placed fourth among the boaters with five bass and 19.62 pounds. He took the tournament lunker title with a 6.37-pounder. Kevin S. Apple of Broken Arrow rounded out the top five boaters with five bass at 18.28 pounds with a 6.12-pound kicker. In the Co-Angler Division, Steven G. Roberts of Broken Arrow, 51, landed three bass going 14.98 pounds for nearly a five-pound average. He upped his average with a 6.21-pounder, which won the division big bass contest. For the victory, Roberts earned a guaranteed $2,500 plus a $318 bonus for the bucketmouth. Jim Brock of Tulsa took second among the co-anglers with three bass weighing 11.74 pounds. Branson L. Phillips of Broken Arrow followed with a three-bass division limit weighing 11.30 pounds. In fourth place, Billy J. Arnold of Chouteau landed three keepers at 11.02 pounds including one 4.37-pounder. Caleb Rogers of Sallisaw wrapped up the top five co-anglers with three bass for 10.48 pounds with a 4.64-pound kicker. For more information on this tournament, call Porter Trimble at 318-201-3474 or ABA at 256-232-0406. On line, see www.americanbassanglers.com.